– Winter activities including: snowshoeing, cross-country skiing and alpine skiing. Guest at ‘La Bergerie’ to make trips on foot, on water, on two wheels or on skis all year round. We can give you tips and advice for all these activities. Don’t be startled when you hear someone whistling during your hiking tour. It is just the sound of the alpine marmots informing their pals of your arrival. 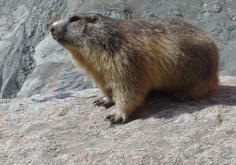 You are bound to hear and see the marmots in Ecrins National Park. This park borders our village, which makes our guest house the ideal point of departure for numerous trips to Ecrins National Park. The Queyras Regional Park is also very close by. There are multiple possibilities, from hiking tours through woody valleys and centuries-old villages to challenging alpine treks. Many of the marked day-long hikes and even four of the GR (Grande Randonnée) trails pass by ‘La Bergerie’. Hiking here is possible all year round. 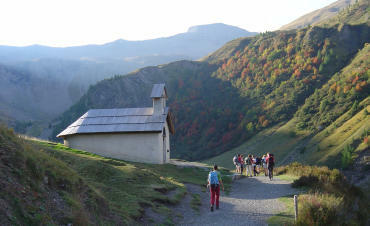 How about visiting ‘La Bergerie’ in autumn? Around that time of year it is wonderfully peaceful here and the weather is very settled. And think of all the beautiful colours! Consider these challenges: going to the most challenging col of France – the Col du Parpaillon – or to the well-known and infamous cols of the Tour de France, such as the Col du Galibier, the Col du Lautaret or the beautiful Col d’Izoard. Daunting? We actually think so too, but those cols sure are beautiful! Being keen cyclists ourselves, we can give you several tips and route descriptions. Because of the mountainous terrain, most routes are of moderate to hard difficulty. 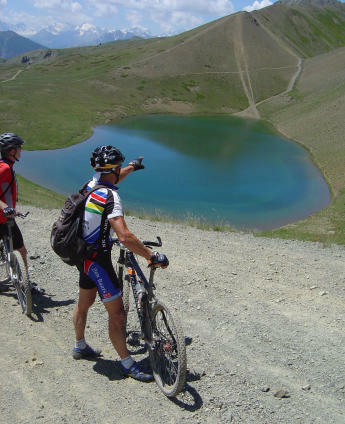 But simple and enjoyable bike rides that are suitable for everyone, perhaps combined with a picnic near a mountain lake, are also possible from ‘La Bergerie’. From our front door, you can follow challenging and amazing trails straight into the mountains. Here your mountain bike can really serve its purpose. And let’s not forget the favourable climate. There is little mud to be found because we have 300 days of sunshine a year. No dirt, mud or rain, but dry trails. And that makes cleaning your bike a lot easier! Close to 2500 miles of marked trails, for beginners and keen cyclists, are waiting there for you. We also have a workshop available for repairing and maintaining your bike. There are new challenges every day. Enjoy! The meals provided for you in ‘La Bergerie’ aim at delivering sporting achievements. After all, a French breakfast will not get you very far. We are avid mountain bikers ourselves. We will go out whenever we get a chance. We can therefore give you a lot of tips on routes and possibilities. We also provide downloadable routes for your GPS. All trails offer everything that makes mountain biking such a wonderful sport. Thankfully you can still ride your bike everywhere around here. There are no forbidden or closed trails. Let’s go! The Durance area is a paradise for any white-water rafter. From the early spring until late autumn rafting is possible on several rivers. The combination of sun and flowing water create the perfect conditions for great adventure. Several rivers, such as the Durance, the Guil and the Guisane, are only a short distance from ‘La Bergerie’. There are even two slalom courses nearby, one in Argentière and one in St. Clément, about a fifteen-minute drive away. In 2011 a world cup was held on the slalom course in Argentière. We can also organise adventurous raft trips on the Durance for small groups with a minimum of six participants. ‘La Bergerie’ has a lot to offer for climbers too. Because of the favourable climate climbing is possible from March until November. There are multiple climbing rocks with routes of different difficulty levels located at walking distance from ‘La Bergerie’, which makes our guest house a tad more special. Only a short distance away from our guest house, there are four climbing walls: one for beginners, two that are slightly more difficult (le Cala and Barachin) and a fourth one (Le Pouit) for advanced climbers. At Le Pouit the climbing routes start at 5a. The best climbing wall is located in the region Le Ponteil, which is a ten-minute drive from our guest house. The climbing walls in this part of the Hautes-Alpes are described in a guide called “Grimper dans le Haut Val Durance” (Climbing in Val Durance) by Yann, Martine and Jean-Jacques Rolland. With the summits in the Ecrins nearby you can of course also climb several large walls or well-known summits. Close by in Freissinières and in Argentière there are also three via ferratas. 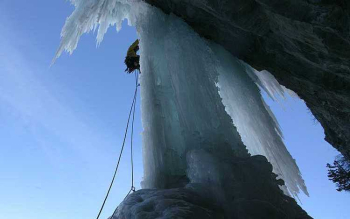 If you would like to climb during wintertime, you can go ice climbing. Every year a meeting is organised in Argentière for ice climbers from different countries. This week-long event involves climbing frozen waterfalls and several other activities. (See also Winter activities – Ice climbing). 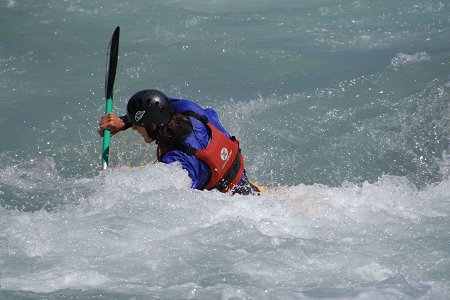 Is canyoning a form of climbing or is it a water sport? Whatever it is, it does require the use of climbing and descending techniques. Champcella has two canyons: the Goufre de Gourfouran (Byasse) and the Tramouillon. Until recently both canyons were popular places to descend, but the village of Champcella has banned canyoning there. But don’t worry, because you can make a simple descent in the Fournel valley (about a 20 minute drive) or in the Byasse near Dormillouse (at the end of the Freissinières valley), which is called the most beautiful and most difficult canyon in France. Several other canyons can be found close by. • Paragliding; several possibilities and schools. At hour guest house you will find all kinds of books and maps which will give you ideas about what to do. Bad weather or don’t fancy going on extreme trips? We have various movies and books so that you can also enjoy these adventures from a comfortable chair. Winter is of course perfect for cross-country or alpine skiing or for taking nice walks in snowshoes. Our guest house is a great starting point, since winter activities can be enjoyed right outside our front door from December until March. The ski lifts will often be running from early December and close at the end of April. The ski touring season will continue for a considerable time after that. Moreover, our guest house is also a perfect ending point, where a warm fire and hot drinks or a glass of wine are awaiting you after your day of outdoor adventures. Once you have experienced the space and quiet of snowshoeing, you will be hooked. No lengthy practice sessions, just strap the snowshoes to your hiking boots and head for the mountains. Snowshoeing gives you an extreme sense of freedom. You can set off individually or with a guide. To help you on your way, we have mapped out a few snowshoeing routes. You can also walk and prepare these routes using a GPS. We provide GPS’s as well as downloadable routes. The tourist offices in the surrounding villages also have many routes available. You can rent a fine pair of snowshoes from the brand Inook from us. We have gained a lot of experience in snowshoeing and it has become our specialty. 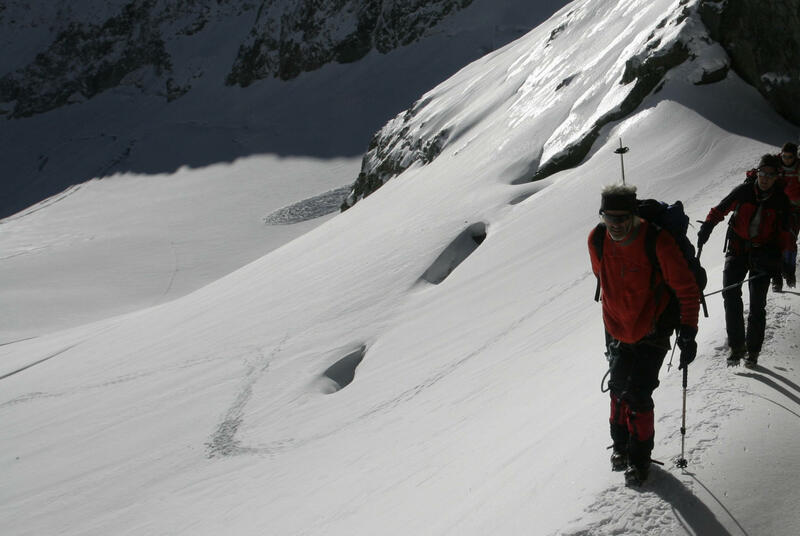 With the high summits of the Ecrins close by, it is obvious that the possibilities for backcountry skiing are endless. The area is guaranteed to have snow and allows for some amazing trips to be made. Our favourite winter activity is telemark skiing. Learning the elegant and sporty telemark skiing technique is great fun. But it is even more fun to take beautiful telemark skiing trips. Once you have experienced the space and quiet of off-track skiing, you will never want anything else! So be careful, it is very addicting. As a cross-country skier, you have numerous other possibilities. Some examples of beautiful trips are to the Col des Combes (1700 m), the Col d’Anon (1800 m) or to the Cabane de Tramouillo (2000 m). Cross-country skiing is fairly unknown around here, which is not a bad thing, because it allows you to walk through an amazing mountainous landscape for miles without meeting another soul. Close by, in the Freissinières valley you will find some beautiful double-tracked ski runs (skating and classic) about 12.5 miles in length. It is great to make a round on these relatively simple ski runs. 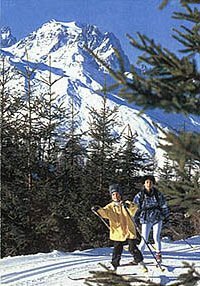 The cross-country ski area of Vallouise/Les Vigneaux is a fifteen-minute drive away. 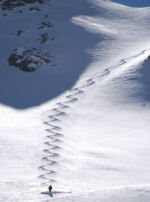 Some fine tracked ski runs can be found here too. A little further away is the cross-country ski area of Puy St. Vincent. These beautiful ski runs don’t pass through a valley but go high up into the mountains. Because of the altitude of around 1800 metres the snow conditions are often excellent and the beautiful panoramic views are stunning. If you came by car, you can drive to other beautiful cross-country ski areas, including Ceillac, Clarée-dal, Cervières and de Queyras, in half an hour. If you like to visit a different ski area every day, you can choose from a large variety of different areas. There are no ski lifts in Champcella itself. 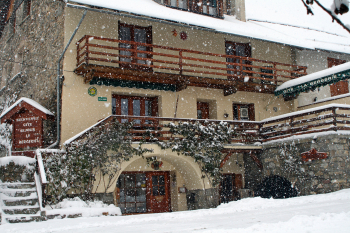 The nearest ski areas (Puy St. Vincent and Vallouise/Pelvoux) can be reached in about twenty minutes by car. Drive another ten minutes and you can use the ski lifts of the large ski areas of Serre Chevalier (250 km of ski runs), Vars/Risoul (180 km of ski runs) or the Olympic ski area of Montgenèvre/Sestrière (400 km of ski runs). Furthermore, several small ski areas in the Queyras can be reached in about 45 minutes by car. The atmosphere in these ski areas is generally more relaxed than in the ski areas on the north side of the Alps. Usually, there is no shortage of snow. Bon ski, bon glisse! The Hautes-Alpes, and especially the Freissinières and Fournel valleys are known for the large number of ice climbing possibilities. The Freissinières valley and the various cascades are only a five-minute drive away from our guest house. Both valleys are famous among ice climbers from all over the world. Every year an international ice-climbing meet is held in Argentière at the beginning of January. The possibility to make a dog sled ride is a famous winter activity that we can arrange for you. Laurent and Sylviane are the proud owners of a large pack of huskies. They organise different sled rides from Vars that last from half an hour to an entire day. It is even possible to ride your own sled like a true musher for those interested. We can make the reservations for you.